If nothing else, Bryan Fuller is consistent — consistently good and consistently cancelled, in that exact combination. I suppose I shouldn’t be surprised that his Pushing Daisies would suffer the same fate as the series he created previously, Dead Like Me and Wonderfalls, even if Daisies had the potential to appeal to the widest range of mainstream broadcast TV-watching 18- to 45-year-olds. It didn’t, it turns out. And now Daisies has been effectively canceled — not even given the honor of being shot at point blank range but instead just left to wither away into nothing as the remaining filmed but as-of-yet-unaired episodes trickle out here and there, probably on Friday nights, probably in August, probably opposite whatever other station’s programming blocks ABC had determined to be unbeatable. Yes, the whimsical and lighthearted show about death — and not only death but also the strange liminal space between life and death — now itself exists in a vague, undefined way: effectively doomed but suspended from passing on for the moment, showing false flickers of life here and there, being and not being at the same time. It’s not all unlike series protagonist Charlotte Charles (a.k.a. Chuck, a.k.a. Lonely Tourist Charlotte Charles, a.k.a. the formerly dead Charlotte Charles), who herself was always only a fingertip’s touch away from a dirt nap and whose “reboot” could theoretically have rendered her sort-of alive but maybe not quite so much alive as you and me. Perhaps we will never find out exactly how alive Chuck really was, especially if that was a question Fuller had planned to answer sometime around season three. Not two days ago, I thought about writing something here about the show and its many lingering mysteries. Watching Wednesday’s episode, Roommate Aly questioned not whether Chuck qualified as a zombie — which she probably doesn’t, I’ve decided — but the nature of Chuck’s relationship with her two aunts — two women who, we found out recently, are actually only one-half Chuck’s aunts. It almost seems like a moot point now, but I’ll suppose that I’ll write out anyway, in tribute to a show that at least caught my attention enough that it make my brain muscle work. At the show’s start, we learn that Chuck was raised by her spinster aunts, Lily and Vivian, after her father, Charles Charles, passed away. (This happened as a result of Ned No Last Name’s ability to revive the dead but only at the expense of another life of approximate value, in true algebraic style. But that’s nether here nor there as far as this conversation goes.) As the show progressed, however, we learned that Aunt Lily was, in fact, Mom Lily, and that she gave birth to Chuck in a convent in an effort to hide Chuck’s existence from Vivian. Lily did this because her lover — and Chuck’s father — happened to be Vivian’s fiance. Lily has never told Vivian about the affair and ensuing pregnancy. At the time of his death, however, Chuck’s father was not living with or apparently still seeing Vivian, as far as I recall, so it’s presumable that the couple had a falling out at some point, likely because he had fathered a child with his supposed lady love’s twin sister and he consequently felt guilty. (If nothing else, he had to explain that Baby Chuck came from somewhere.) Nonetheless, when Charles Charles kicked the bucket, Chuck ended up living with Lily and Vivian, whom she was told were her aunts. 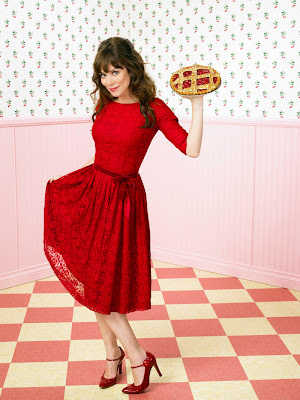 This seems strange, either in manner of a glaring plothole or the kind of thing that a detail-oriented show like Pushing Daisies would have eventually addressed. (I hope it’s the latter. And I hope the remained seven episodes touch on it in some way.) I mean, even if a guy has no living relatives, the logical choice for a guardian for his kid in the event of his untimely passing shouldn’t necessarily be his ex-girlfriend and her sister, especially when the latter of whom shares no public relationship with him. It makes for a weird conversation. I mean, Lily has good reason to care for Chuck, but why should Vivian want to house her ex-boyfriend’s child by a never-named and apparently vanished mother? But as I said before, the point seems less worthy of pressing at the moment. I heard about this tragic news last night. Yet another reason why I have very little faith in Hollywood and even less faith in the American people. For real. As Pajiba pointed out, the fact that Daisies would be axed and drek like According to Jim would remain is especially unsettling. I always thought that despite being axed, Dead Like Me still ended with relatively few loose ends and a final episode which made the two seasons feel somewhat complete. I'll miss this show, and Chuck's wardrobe. Also, I wonder if Ned's last name also starts with N? As Stephen Root's character is Dwight Dixon and Chuck's dad is Charles Charles? So, I'm going to assume Ned's last name is Nederson. 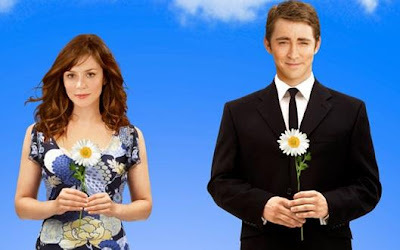 Also, for your consideration, would Pushing Daisies have survived better in an Obama administration? On Ned's last name: It's quite possible. It's also quite strange that a show that clearly puts a lot of thought into names would not state the main character's. Also, I have a gut feeling that Ned is "Ned" only because it rhymes with "dead." "Paul F. Tompkins apologizes to Pushing Daisies fans for last night's ratings-- the lowest in the series' history. Enjoy the comic book!" "Paul F. Tompkins apologizes for being the nail in the Pushing Daisies coffin! Now tune in to VH-1 tonight at 11 for a show Paul has yet to be the cancellation of!" Do you know anything about a comic book? I've heard Fuller may wrap up the storyline in a comic book or a movie. I think I'd prefer the movie, honestly, if only so Lee Pace and Anna Friel get one more paycheck. Did your friend Paul play the geek? The cancellation of the show was not only his fault, I suppose. The lady who plays Wiegel on Reno 911 was on the show, too. I'm putting more blame on her. ha ha! Yeah, Paul was the geek. Too freaking funny. I envy you Megan... Paul Tompkins is awesome.